This property is part of the Golden Mile Villas. 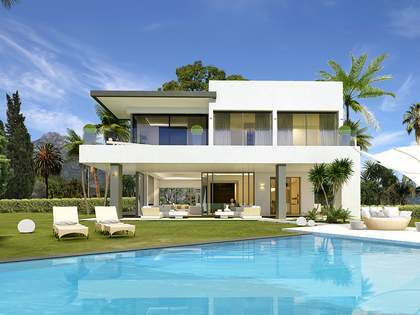 Seven stunning contemporary villas on Marbella’s Golden Mile with abundant natural light, 2 swimming pools each and innovative home technology. Stunning contemporary villa on Marbella’s Golden Mile with abundant natural light, 2 swimming pools and innovative home technology. Within a prestigious neighbourhood, close to Puente Romano, we find this exciting new development of just 7 exclusive villas in a tranquil residential complex with 24-hour security. 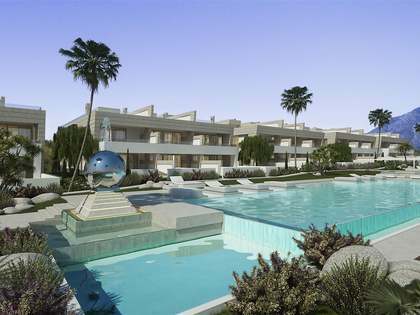 The centre of Marbella and the world famous Puerto Banus are conveniently located very nearby. The idea behind these modern villas has been to blend comfort and practicality, luxury finishes and cutting-edge home automation technology. This particular villa makes an ideal spacious home for families with a beautiful open living area with large windows and fitted kitchen equipped with high quality appliances. On the ground floor we find the wonderful open plan living, dining and kitchen area with access to a porch, garden and the swimming pool. Two en-suite bedrooms and a guest toilet complete this floor. The spacious master bedroom is on the first floor and boasts an impressive wooden dressing room, an en-suite bathroom and a lovely terrace with a porch area. There are 2 more en-suite bedrooms on this level, one of which has a terrace. On the rooftop terrace we find a fabulous solarium and swimming pool with far reaching views. Ideal as a summer chill out area. The basement houses a multipurpose room and plenty of storage space as well as an en-suite bedroom and utility area. Superb modern villa in a prime Marbella location. This elite new development of just 7 highly exclusive villas is located close to Puente Romano, in a peaceful private complex with 24-hour security. This is one of the most prestigious addresses in Marbella, at the centre of the famous Golden Mile, very close to the centre of Marbella and the glamourous Puerto Banus and with direct access to the motorway.